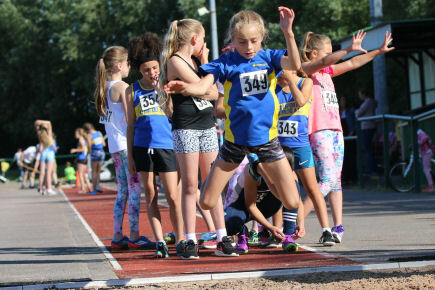 Our teams today were slightly depleted (except for the U13 Girls) with a YDL Upper meeting the day after at Ashton Under Lyne, but this did not detract from some of the performances. Amongst are young Athletes we are blessed with an abundance of talent and today first year U13B Sammy Pickerill ran his best ever 800m in 2:24.8 just 0.3Sec off a Grade 2 AAA standard. (Just proves hard training pays off). Sierra & Amber continue to impress with grade 1 times in the U13G 100m, Sierra adding a Grade 1 time in the 200 again and Amber jumping a grade 2 distance in the Long Jump. Not to be out done there were in total 11 graded performances and 16 PB’s from our 27 Athletes here today with some also trying new events not done before in competition. Senior Men: Chris Burgess, Graham Boreham & John Byrne competed today. Chris running 12.6 in the 100m, 25.0 in the 200m and put the 7.26Kg Shot 8.22. Graham Boreham ran 25.4 in the 200m and 54.1 in the 400m. John Byrne had a first competitive outing in the Long Jump with an impressive 4.97m and jumped an =PB of 1.55m in the High Jump. U17Men: Just Luke Suarez out today, most saving themselves for the YDL, but Luke was off on Holiday on Sunday so ran a 400m in 55.1 today instead. 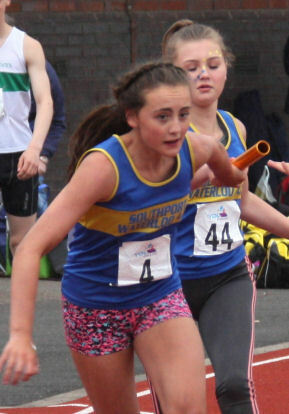 Lauren Byrne ran the 100m in a PB 15.2 High Jumped to a grade 4 height of 1.25m and threw a PB in the Javelin with 14.51m. Aimee ran 16.9 in the 100m, ran a first time 200m in 34.9 and then (brave Girl) ran a PB 3:02.3 in the 800m. Apphia ran 32.6 in the 200m, long Jumped 3.5m and threw a Grade 4 PB in the Javelin with 15.97. Libby Simpson ran the 800m in 2:50.7 with Jemima running the 800m in 3:12.2 for her first competitive attempt. Sahara Jalloh long jumped 3.44m and new athlete Alanna Garner jumped 3.47m. So many U13 Girls wanted to run the relay that the team manager delegated the decision to the girls themselves. And so another Mid Lancs fixture is stored into the memory banks, thanks go to all the well baked Athletes who performed today, to the ever busy Sheila Marshall & Sue Stewart with the catering, Gareth Williams as Announcer, Lee Coupland for managing the team and our team of Technical officials Steve James on Track, Dave Whitehead as Chief Timekeeper and our Field Judge team, Steve Boreham, Emma Howarth, Lee Coupland and Barrie Hughes. Pictures supplied by Graham Boreham. The next Mid Lancs Fixture is at Barrow in Furness (once described by Mike Harding as an Old Industrial town at the end of a 20 mile cul-de-sac) on Saturday 28th July....See you there at their brand new Athletics facility at Furness Academy https://www.barrowstriders.com/location ! 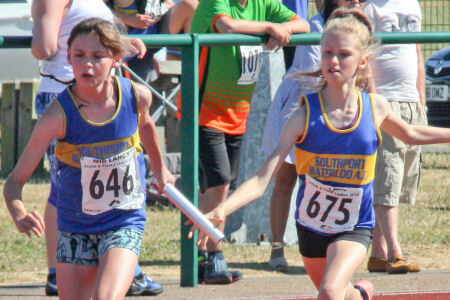 Whilst older children earn selection for the Merseyside team going to the English Schools' national Championships in July, there is an opportunity for Year 7s to be selected for the annual Inter Counties match against Cheshire at Ellesmere Port on Wednesday 4th July. There was a great turnout of senior runners at the Penny Lane 10K on Sunday; 17 in all, 10 of our female runners and 7 male. The overall race winner was Jamie Rutherford from Liverpool Running Club in 33:44 with Penny Lane's Hazel MacCormick wins the women's race in 39:40. Another fine run by Francois Rafferty brought him home 12th of the 427 finishers in 37:11. Keith Lunt ran 39:52, David Wright 40:54, Carl McMahon 40:55, Stephen Ward 41:02, Mike Walker 42:20, and Graham Liu finished in a PB 47:30. Our women were led home by Trace Allan in 41:23, then Amanda Bradbury in 52:19 followed by Sarah Lunt in 53:15 and Sue Stewart in 53:18. Others were Gina Bellhouse 53:49, Sophie Bennett 54:34, Helen Lodge 54:37, Susan Cooper 55:43, Mari Dyson 58:14, Catherine McElhinney 58:24 and Jane Blacklin 58:38. The race featured in both the club's Grand Prix of road races and the Merseyside Grand Prix. In the latter, our women finished 4th team and our men were 3rd. See the Merseyside web site for more M'side GP info. Current Standings in the club's Grand Prix can be seen here. Mike Walker and Tracey Allan are current leaders with three races to come. Runners should note that the Wirral Seaside run on 25 July which replaces the August Mystery 5k in the Merseyside GP has increased the race limit to 500.. Pensby Runners who organise the race have arranged on-line entries and chip timing. On-line entries are now open - https://seasideruns.niftyentries.com/, and also see the race website for more info. There are no entries on the night. 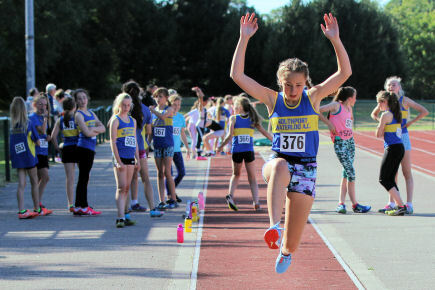 As reported on 5th June below, Katie Piercey, Niamh Procter, Sam Coupland, Luke Suarez and Drumayne Moore were selected for the Merseyside combined events team at the NW Schools Combined Events Champs held at Stockport over the weekend. The Merseyside Junior Boys' team won their competition and so they go on to the Final in Bedford in September. 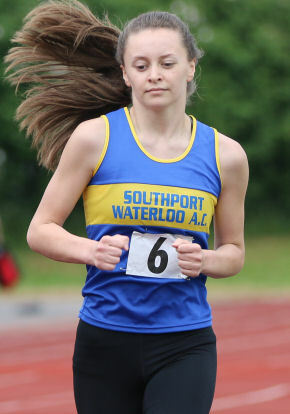 Sam Coupland was part of the winning team and may well be the first Southport Waterloo athlete to make it to a Schools CE final; certainly in living memory. And to top it off, Sam's pentathlon total of 2543 was a new Club Record! Katie Piercy and Niamh Procter competed as Junior Girls. Katie ran a Season's Best 800m in 2:50.06, ran 13.33 for 75 hurdles, cleared 1m 30 in the high jump, cleared 3m 89 in the long jump put the shot 8m 55 and amassed a new PB Pentathlon score of 2126. Niamh ran 2:57 for 800m, ran 15.44 for the hurdles, cleared 1m 33 in the high jump, cleared 4m 48 in the long jump - a good new PB - put the shot 4m 78 and, in her first pentathlon, scored 1805 points. Junior Boy Sam Coupland ran 12.99 for the 80m hurdles, cleared 5m 35 in the long jump, put the shot 9m 60 for a massive new PB, cleared 1m 65 in the high jump and finished with a great new PB in the 800m - 2:15.01! That gave him a new Pentathlon PB of 2543 points. A great score and a worthy new club record. Luke Suarez and Drumayne Moore competed as Inter Boys, both competing a number of events outside their comfort zones as sprinters. Luke ran 54.01 for 400m, 5:13 for 1500m, 16.58 for 100m hurdles, cleared 1m 60, equalling his PB, in the high jump, cleared 5m 75 in the long jump, put the shot 6m 81, threw the discus 20m 94 and even without a successful javelin throw he amassed 3241 points in his first Octathlon. Drumayne ran 60.44 for 400m, 5:59 for 1500m, 18.16 for 100m hurdles, cleared 1m 51 in the high jump and 4m 56 in the long jump, put the shot 7m 58, threw the discus 21m 28 and the javelin 18m 88 to amass 2538 points in his first Octathlon. Well done to all our athletes and good luck to the Merseyside Junior Boys in the Final in September. One additional point of interest. 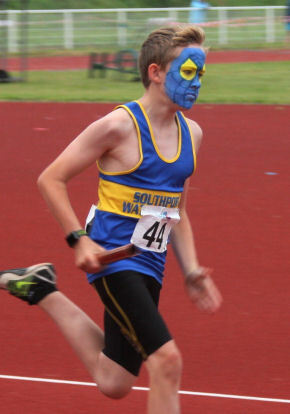 Combined Events has not had much of a profile in Merseyside Schools for a number of years and they had no Team Manager. Step forward Barrie Hughes and now we are seeing some success. Great work Barrie! Its not just our athletes that make the news on this site. Litherland sprints coach Graham Pilkington is highly regarded as an England coach and team manager and travelled to Guernsey to look after the England Women's Under 20s Team Sprinters, Hurdlers and 4x100 Relay team at the Guernsey InterTrust Games. This was the first time any England Athletics team had competed in Guernsey where they were up against a composite senior Channel Islands Senior Team and Scotland Junior Team as well as guest athletes. The team flew out from Stanstead and Manchester on Friday evening, returning back early Sunday morning. Both the men's and women's teams won their respective matches and the women's relay team briefly had the fastest time for any Under 20s team this year, until this was taken on Sunday by a GB Under 20 team in Mannheim! This was Graham's second international this season after attending the Loughborough International as an England Senior Team Sprints Coach at the start of the season. 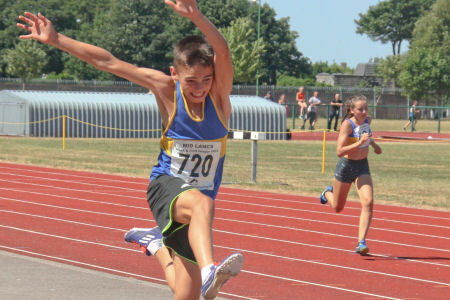 With many of our young athletes taking part in Combined Events competition, including quadrathons for younger members, it was perhaps a natural progression to try hosting a QuadKids competition ourselves. The idea came from Barrie Hughes who organised Friday's event, solely for club members. It was a gloriously sunny afternoon and it was clear that all the kids and the officials, parents and coaches enjoyed it..
51 young athletes from Under 9 to Under 15 took part and, quite apart from the competition, it was a great opportunity for so many of our youngsters to come together and socialise with others off the track. but all deserved their individual medals at the end of the meeting. Under 11 Renee Adams reached UKA Silver level with a points total of 189. Both 2nd placed Hannah Keenan and 3rd placed Erin Griffin achieved Bronze level. Under 11 Joseph Wake's 219 points earned him the Silver standard as did Jamie Simpson's 217 score; just 2 points between 1st and 2nd. Under 13 Amber Hughes scored a massive 278 points achieving the Gold standard. 2nd placed Libby Simpson's 217 points was the Silver standard and 4 girls achieved the Bronze standard: Elizabeth Wake, Jessica Keenan, Evie James and Lauren Byrne. Under 13 Rhys Hulse scored an impressive 288 points, a Gold standard, with 2nd placed Jack Clark and 3rd placed Sammy Pickerill achieving the Silver standard. Under 15 winner Katie Piercy scored 229 points, another Gold standard. 2nd placed Niamh Procter's 202 points was a Silver standard. 3rd placed Eleanor James' 198 points and 4th Penny Page with 189 points were both Bronze standards. As this was an intraclub event and not a permitted open meeting the results won't go to Power of Ten but all the athletes can be pleased with their performances. And hopefully the event can be extended next year with young athletes invited from other clubs. This is the strongest team Merseyside has put together for a number of years with only those with Entry Standards considered. We wish them all well. The 3rd fixture of the YDL lower for U13s and U15s saw the team head north to the top of Cumbria, namely the Sheepmount Stadium in Carlisle, which had finally reopened in March following its drawn out repairs and rebuilding after being badly damaged by the floods of December 2015. With numbers in the team slightly down on the first 2 fixtures and with Team North Cumbria hosting this match, this was a match that everyone knew would be difficult to win. Surprisingly though, TNC didn't field as big a team as expected and a strong performance from our 29 athletes combined with the all important 55 points for a full team of officials saw us win the match in the end, although we were run very close by the host club. The final scores were Southport Waterloo 561.5 , Team North Cumbria 546.5, Wigan 499, Bury 471, Leigh 399.5, Macclesfield 358.5 and Warrington 291. With Bury only finishing 4th, this means that they are now 8 points adrift of us in 3rd place in the league table and with 2 teams to be promoted, we have guaranteed ourselves 1 of those places going into the final fixture so next years fixtures will be played in West 1. In terms of performances on the day 2 really stood out, the 2 which broke club records. Sierra Jalloh ran an outstanding grade 1 19.6 in the 150m to beat her own club record by over 2 tenths, while the same U15 Boys 4x300 team as the previous fixture took 4.4 seconds off their record as they battled back to win the race on the last leg, finishing in 2:47.8. Overall there were 28 graded performances and 32 PB's across all 4 age groups. 9 Under 13 Girls made the trip up to Carlisle and they were Amber Hughes, Sierra Jalloh, Grace Malone, Jessica Keenan, Libby Simpson, Evie James, Jenna Christian, Apphia Keenan and Rachel Murphy. Such is the quality in this age group at the moment that there were 5 event wins, 4 B event wins and no less than 11 graded performances. Amber took maximum points in all 3 of her events and all were grade 1 standards, winning the 70m Hurdles in 11.3, the High Jump with 1.40m and the Shot with 9.78m. Sierra did exactly the same as Amber, winning the 75m in a grade 1 10.3, the 150m with the previously mentioned club record 19.6 and the B Shot with 7.90, a grade 2 performance. Grace was the B athlete in both sprints and took maximum points in both with 10.9 for 75m and 21.4 for 150, both grade 3 standards. In addition she also ran as B runner in the 1200m following a late withdrawal and finished in 4:40.0, taking 3 seconds off the time she ran this distance last year. Rachel also featured in the 1200, finishing just 0.6 seconds behind Grace in 4:40.6. 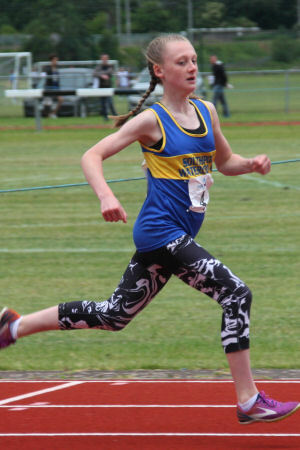 Libby stepped up to the A race in the 800m and she finished in 2:42.0, taking more than 5 seconds off her previous best set earlier this year and now within a second of a grade 4 time. 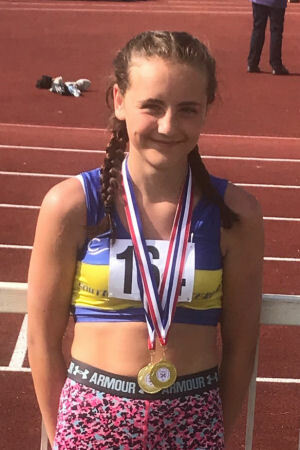 Competing in the YDL for the first time, Evie ran in the B race in a very creditable 2:48.8, within 1 second of the PB she set last month at the county championships. Jessica ran a very good Hurdles race but was just beaten into second place, with both being given the same time of 12.7 which is a new PB and a grade 4 time. Jessica and Evie also both ran in the Non Scoring 75m too, running 11.7 and 11.6 respectively. In the field, Jenna extended her Javelin PB by 72cm to 16.74m which is a grade 4 throw and she also jumped 3.34m in Long Jump and 1.20m in High Jump. Apphia also competed in Long Jump and Javelin and equalled her PB in Long Jump with 3.57m while her Javelin throw of 15.56m was just 3cm short of her PB and another Grade 4 throw. In the first 2 fixtures, the 4x100 quartet of Jessica, Grace, Amber and Sierra won the race with ease and today was no exception with Sierra bringing the baton home in 53.6, the second time they have run under 54 seconds this season. Marcus Burgess, Sammy Pickerill, Will Collins, Will O'Donnell and Rhys Hulse were the Under 13 Boys at Carlisle. Just the 1 event win here with Rhys winning the Long Jump with 4.68m, just 3cm short of his PB and a grade 2 standard. Even better though was his 200m; running it for the first time this year, he took nearly 3 seconds off his PB to come home 3rd in a Grade 1 26.5, which puts him at the top of the club rankings for this year in U13 boys. His final event was the high jump, in which he cleared 1.20m. Sammy was leading a close fought 800 for most of the race but was just pipped to the line, with both athletes being given the same time of 2:30.1 which is a grade 4. 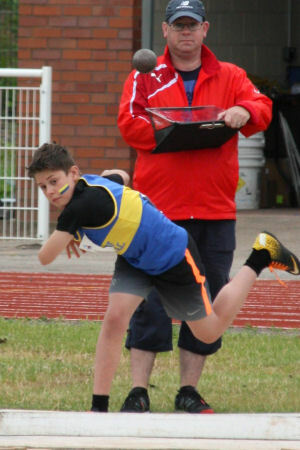 Sammy also contested the Shot and Javelin for the first time in competition, throwing 3.19m and 12.06m respectively. Marcus fell at the first in his hurdles race but quickly got back on his feet to finish in 17.9. He also ran a 15.0 100 and threw the shot 6.15m. Will O'Donnell contested 3 track events, equalling his PB in 100 of 14.2, while he ran 200 in 29.0, a grade 4 time and less than 3 tenths outside his PB and the 1500 in 5:24.7. Will Collins also ran the 1500, finishing in 5:42.9 and competed in High Jump for the first time today, clearing 1.05m. He also long jumped 3.36, an improvement of 5cm from the previous fixture. Finally, Marcus, Sammy, Will O'Donnell and Rhys finished 2nd in the 4x100 in 56.8. The Under 15 Girlswere Katie Piercy, Eleanor James, Hannah Williams, Niamh Procter, Millie Ireland and Chloe Sutton. Katie improved her PB in the Hurdles, running 13.1, an improvement of 1 tenth and a grade 4 time. She also threw 7.90m in shot and finished 2nd in Javelin with a grade 4 24.62m. Niamh extended her Long Jump PB to 4.31m and competed in Shot for the first time, throwing 5.41m. In the high jump she cleared 1.30m. Millie scored valuable points in the throws, with 13.55m in the Hammer, 9.75m in Discus and 5.87m in Javelin. Eleanor also threw the Hammer for the first time and finished 3rd B in 5.13m. A 2:42.8 800 followed, after which she knocked 0.7 off her 300 time, crossing the line in 49.8. Chloe also ran the 300 in a PB 57.3, along with 100 in 16.4 for 100. Throwing the Discus for the first time in competition, she also finished 3rd B with 7.32m. Hannah ran the hurdles in 14.2, an improvement of nearly 2 seconds and completed the 100 in 15.3 after long jumping 3.34m. At the end of the day, Hannah, Niamh, Millie and Katie ran the 4x100 in 59.0. The Under 15 Boysalso featured 9 athletes. They were Sam Coupland, Joshua Stammers, Leo Christian, Joe Sutton, James Pike, Joe Kane, Ethan Stanworth, Jonathon Pilkington and Tom Murphy. In common with the U13 Girls there were 5 event wins, 4 B event wins and 11 graded performances. Joe Kane continues to run Grade 1 times consistently in the short sprints and today was no exception. He finished 2nd in the 100 in 11.7, less than a tenth outside his PB and won the 200 in 23.8, again just 1 tenth outside his best. Ethan won the B 100 in a PB 12.2 which is a grade 4 time and competed in 300 for the first time too, winning the B race in a grade 3 40.1. Josh was the B runner in 200, equalling his grade 3, 24.8 PB to win that race then finished 2nd in the 300 in a PB 39.7, also a grade 3 standard. He also won the B Long Jump with 4.81m. 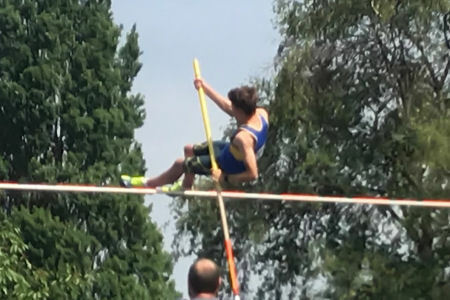 Sam competed in Long Jump, High Jump and Pole Vault taking maximum points in all 3 with a grade 4 5.14m, a grade 3 1.60m and 2.80m, which is also a grade 4, respectively. Leo has been training twice a week for the Hammer and has increased his PB enormously over the course of this season. No PB today but his grade 3 throw of 34.85m comfortably won the competition, with 2nd place throwing nearly 14 metres less! He did improve his PB in the shot though by 27cm, with 8.08m giving him a 3rd place finish. On the track he also ran the 800 in 2:22.7. Tom Murphy ran the 800 for the first time to score some extra points for the team and finished in 2:41.0. Earlier on Tom won the 80m Hurdles in a PB equalling, grade 4 13.2. Jonathon finished 2nd in the B hurdles in a PB 16.6 and scored valuable points in the field with an 11.43m Discus throw and a 1.25m High Jump. 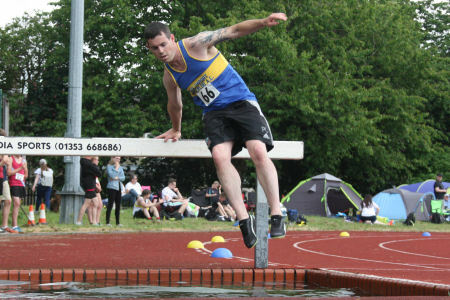 Being unable to run at the moment, Joe Sutton concentrated on the throws and was rewarded with 3 PB's from his 3 events. His 16.00m Discus throw was an improvement of nearly 3.5m on last time out while he extended his shot PB by 59cm to 4.81m. The last of the 3 was Javelin and he threw 1.72m further than the previous fixture, taking his best up to 15.33m. 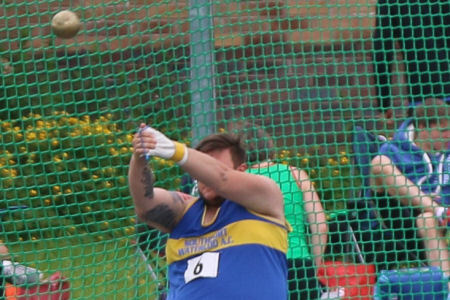 James also threw a PB in the Javelin of 12.76m and also competed in the Hammer, where he improved his PB by nearly 2.5 metres to 13.00m and the 1500 which he finished in 6:08.7. At the end of the day Tom, Josh, Ethan and Joe Kane won the 4x100 in 48.9 but it was the 4x300 which was the real spectacle with Jonathon, Joe Kane, Leo and Sam in the team. Wigan had opened up a huge gap between them and everyone else by the end of the first leg but this was gradually pulled back over the second and third legs, leaving Sam to take the lead 120m from the finish. As already mentioned, the time of 2:47.8 is a club record by 4.4 seconds and you just wonder how much faster those 4 can run before the end of the season. Thanks to all athletes and officials Steve Boreham (who was field referee on the day), Lesley Scott, Chris Henders, Lee Coupland, Dan Stammers, Barrie Hughes, Dave Whitehead (Chief Timekeeper) and Chris Burgess who all made the long trek up to Carlisle on Sunday. While it was a long day it was certainly worth it. Ed: A brilliant result for team manager Graham Boreham and for all the boys and girls who have supported the team. All will be delighted to know that they have been shortlisted for a Sefton 'Team of the Year' award. The Awards Evening is on Wednesday 11th July at the Southport Theatre and Convention Centre. Well done! This race, 4th in the club's Fell Grand Prix series,is described as a challenging 5.5 miles with a sting in the tail and so it proved. There were a number of stiff ascents to climb during the race, the first of which comes right from the start when the runners climb along the road for half a mile before getting onto the fell. The course then took a gradual climb over the very dry fell to a fast road descent, which the runners have to come back up towards the end of the race. After the descent the course joined the fell again to start the main climb up to the Weets summit. Once at the summit it was down again before another tough climb to join the original track and a fast descent after which came the tough road climb, which was a real ‘sting in the tail’. It was then across the fell before the fast tarmac road descent to the finish. The warm dry conditions made for good fast running which resulted in a new course record of 37.09 being set by the winner Gary Priestley of Salford Harriers. For SWAC Brian Davey was the first runner home in 52.12, Clive James was second home in 61.51. Carole James had a good run to be first lady home for SWAC in 69.47, this was after an early start to get to the race from the Lake District after her swim in Lake Windermere on Friday evening, as part of The Great North Swim. The next Fell Grand Prix race is Tockholes on Thursday 5th July. 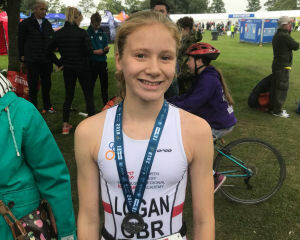 Whilst a number of our junior athletes were over at Bebbington on Saturday a notable exception was Olivia Logan who was instead in Leeds for the Tri Star 3 AJ Bell Triathlon. Olivia had already attained the entry standard for English Schools for the 1,500m and this Triathlon is a major event for UK triathletes. So at 8:05 in the morning, in warm/sunny conditions, Olivia and 40 other under 15 girls from around the country dived into the lake in Roundhay Park for a 300m swim, followed by 5,000m on her bike and finishing with a 2,500m hilly run. Olivia was with the leaders throughout but in the later stages of the run she sprinted away to win the event by 9 seconds in a total time of 29:54. A fantastic result for Olivia and we are very proud of her achievements outside of athletics. 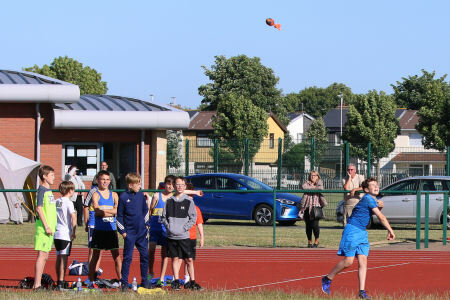 On yet another warm and sunny day, at Bebington Oval, Merseyside County Schools held their annual Track & Field Championships. For Junior, Inter and Senior boys and girls, this provides the basis for selection to the Merseyside team going to the English Schools National Championships in Birmingham in July, but also provides competition for Year 7s, and selection for a Merseyside team to compete against Cheshire at Ellesmere Port in July. So the meeting provided lots of opportunities to earn a county vest. The format was slightly different this year with Year 7 events in the morning and the main championships in the afternoon; but the numbers didn't justify the timetable with many races going as straight finals and long gaps between events. Southport Waterloo athletes were there in reasonable numbers - although more were expected. 25 of our young athletes picked up 32 event medals. They achieved 2 club records - Katie Piercy in the shot and Sam Coupland in the Pole Vault - and Harry Flanagan met the English Schools' entry standard on the day in the Senior Boys' 100m. I believe Merseyside Selectors were meeting on Sunday night to decide on the team going to Birmingham. But I also understand that, for the first time in quite a while, they have more than 40 athletes who have achieved the entry standard. Good for athletics on Merseyside but it may be that there is no room this year for 'near misses'. Athletes are limited to 2 events in this competition and so are likely to concentrate on their stronger events. The fact that PBs were few perhaps reflects the small fields and, no doubt, the effect of the weather on the day. Amber Hughes fairly easy won the 70m hurdles in 11.2, close to her PB. She also won the shot with 10m 58. Sierra Jalloh was another event winner running 20.1 to win the 150m. She also put the shot 7m 94 for 2nd place behind Amber. Jessica Keenan ran the sprint hurdles in 13.1 and long jumped 3m 66. Sahara Jalloh cleared 1 metre in the high jump. Jack Clark won the 200m in 27.6 and he was 2nd in the javelin with a new PB of 27m 47. So not just a good sprinter! Rhys Hulse was 2nd in the 100m race and won the long jump competition with 4m 69, a new PB for him. Katie Piercy was brilliant in the shot setting a new club record of 9m 45 to win the event, replacing Alex Bunclark's 2015 record of 9m 15. She also won the javelin with 24m 24. Niamh Procter cleared 1m 30 in the high jump and her 4m 15 long jump was a new PB..
Millie Ireland threw the hammer 11m 45 and her 3:07 800m run was a season's best. 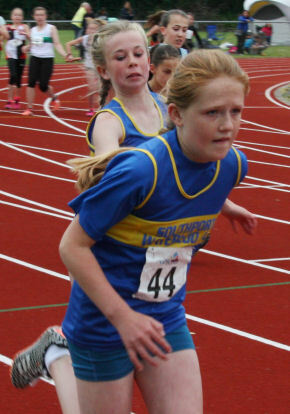 Although not running at Bebington, Olivia Logan has run a 1500m this year, at Stretford, in 4:44.44, well inside the Entry Standard of 4:48.0. Sam Coupland set a very good club record in the pole vault clearing 3 metres with his new pole. That replaces his own previous record of 2m 81 but is 5cms off the English Schools Entry Standard. He won the pole vault and was 2nd in the high jump with a clearance of 1m 70. Entry Standard here is 1m 72 and Sam has already cleared 1m 76 this year. Joseph Kane is a prospect for English Schools but times were just not fast enough on the day. He was 2nd in the 100m in 11.9 and 3rd in the 200m in 24.3, both very good times nonetheless. However, Joseph ran 11.64 at the County Championships in May, inside the 100m Entry Standard of 11.70, and ran 23.7 for 200m in the YDL in May, again inside the Entry Standard of 24.00. Josh Stammers ran 25.2 for 200m and collected a 2nd place medal in the long jump with 4m 97. Tom Murphy took a 2nd place medal with a 13.5 run in the 80m hurdles. Freya Walsh took the 2nd place medal in the 1500m, running a season's Best 5:28.1. Stephanie Robertson won the 80m hurdles in 12.1. She also ran 12.03 at the county championships againt an Entry Standard of 12.0. So close! And she was 2nd in the long jump with 4m 35. Megan Howarth was 2nd in the javelin with 30m 95. She has thrown 36m 60 this year but the Schools Entry Standard is 38 metres. Joseph Stuart was 2nd in the 200m race in 23.5 and he was 3rd in the 100m in 11.8, a new PB. Luke Suarez took the 2nd place medal for his 5m 82 long jump and he ran 12.1 for 100m. 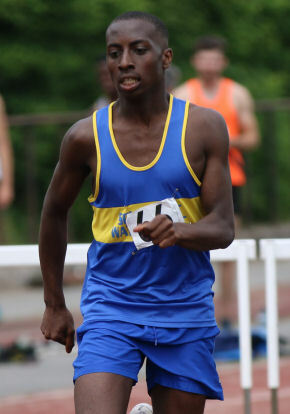 Drumayne Moore took two silver medals, running 71.9 for 400m hurdles and triple jumping 10m 03. Ethan Harrison took a 3rd place medal in the 400m in 55.6 and he ran 12.3 for 100m. Joshua Bankier ran 27.5 for his first competitive 200m. Harry Flanagan was a double sprint champion winning both the 100m, in a Qualifying time of 11.0, and the 200m, in 22.6. He has already run 10.9 this year and 22.0, both inside the Entry Standards. Ben Apps was another Schools' champion, winning the triple jump with 13m 14. Darion Moore took two medals, 2nd placed in the 400m in 57.7 and 2nd again in the long jump with a best clearance of 4m 78. Jack O'Neill ran 13.1 for 100m and 25.7 for 200m. Thanks to Barrie Hughes for the photos used here. James Tartt ran a good race at Birkenhead Park on Wednesday evening finishing 2nd in 26:16 behind strong Liverpool Harrier Jonny Mellor who won in 24:01. The club had 5 runners in this Merseyside Grand Prix event. Mike Walker ran 32:49 for the 5 miles, Tracey Allan was 11th female in 33:42, then Gina Bellhouse ran 41:59 and Billy Hargreaves 44:17. In neither Men nor Women did Southport Waterloo finish a team in the Merseyside Grand Prix but James Tartt was individually 2nd and Tracey Allan 8th. Senior runners will be dismayed to learn of the passing of fellow runner Matt Thompson. Since 2011, Matt has run for the club in cross country and road and was a regular at local park runs. Despite major surgery for a brain tumour, he continued to enjoy his running and even completed three park runs in January this year. He passed away at 2.30pm today in Queenscourt Hospice. 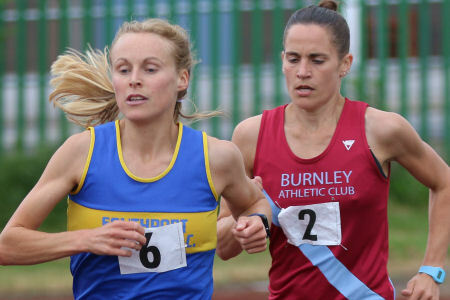 Round 2 of the Northern T&F League was held at the Barden Lane Athletics Track in Burnley, hosted by Pendle on Sunday. We will be back there for Round 3 next month, then hosted by Burnley which makes 2 visits in one season when the club hasn't competed here for over 10 years, in the days of the old McDonald's Young Athletes League. For many of today's visitors from Southport Waterloo it was a first experience of this small but well set out facility; but without a pole vault. With temperatures in the low 20s and with virtually no wind all afternoon, the conditions were very good for athletes and spectators. Team Manager Lee Coupland had a fairly full team-sheet by Friday evening and, although there were some inevitable adjustments needed on the day, we were probably the best supported team at Burnley and certainly the strongest. As team scores were announced during the afternoon, Southport Waterloo was always leading and in the end it was a win by 62 points giving the club two wins from two fixtures in this higher division. The scores were Southport Waterloo 389, Seaton 327, Burnley 310, Kendal 261, Pendle 259 and Border 249. We managed to cover nearly all the events, with our men's team the strongest overall. For some years we have had difficulty attracting female athletes to compete and so it was both interesting and encouraging to note that, today, our 11 women actually contributed more points to the team score than our 14 men; 181 against 163! Our Female athletes were Sophie Bennett, Amy Bloxsome, Katy Coupland, Amanda Crook, Megan Howarth, Eve McMahon, Stephanie Robertson, Milly Smith, Olivia Taylor, Lynn Vickers and Freya Walsh. As usual, and despite a hip problem, Katy did the maximum 7 events; the 100m hurdles (29.9), 400m hurdles (1:52.3), long jump (3m 37), shot (7m 37), discus (2nd with 29m 20) , hammer (18m 90) and the 4 x 100m relay. Milly was another who seemed to spend her afternoon moving from one event to the other. She did 6 events, like Katy in both track and field. Training is causing her track times to come down and she ran 14.2 for 100m, 76.8 for 400m, 20.5 for 100m hurdles and 80.2 for 400m hurdles. in the Field she cleared 1m 30 in the high jump and threw the discus 14m 90 before contributing to the 4 x 100m relay success. Stephanie Robertson was 2nd in the long jump with a new PB of 5.00 metres. She then won the high jump with a PB 1m 35 and went straight into the 200m winning that in another PB of 27.4. The other event win was the 4 x 100m relay. An injured Amy set off at speed to hand the baton over to Milly who was determined she wasn't doing to be passed on the back straight before handing over to Katy who actually increased the lead and, with Stephanie on the last leg, there was no way the girls would be beaten. They finished in 56.6, 2 seconds clear of Burnley. Sprinter Amy had an unfortunate start to the day, falling just before the line in the 100m but getting up to finish. Coach Graham thought it was, until the fall, Amy's best sprint race to date. She carried on and ran the 200m in 30.8 and helped the relay team to victory. Sophie joined the team for the first time today. 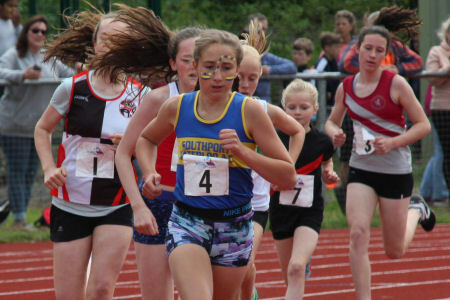 Normally a 10K runner, she ran the track 3000m in 15:23 and the 1500m in 7:20 before joining others in the 4 x 400m relay. Lynn ran an 800m in 3:48 and the 4 x 400m relay. Olivia was the other 800m runner. Also new to track & field, coach Steve had set a season's target of under 3 minutes for the 800m and she did that at the first attempt, running 2:57.9. She also won the 'B' 400m race in 74.5. and ran the 3rd leg of the 4 x 400m in a faster 74.0! Freya came for the 1500m race and finished in 5:31.8 bringing her fast finishing from cross country to the track to get past the Border runner for a 2nd place finish. Probably the most intriguing track event of the afternoon was the women's 3000m which included Amanda Crook, her first time on the track in about 5 years. Amanda and Burnley's Laura Hesketh were locked together for over 7 laps, Amanda in front with Laura on her shoulder. Amanda appeared to put in several increases in pace but Laura always went with her and, with 150m to go, she put in a powerful finish to leave Amanda 2nd in 10:01.4. Amanda won the Halewood 5K on the Saturday in 17:22. I hope we can she more of Amanda on the track this season, unquestionably our best distance runner. Finally, in the throwing events Megan was 3rd in both the snr hammer (20m 79) and snr javelin (30m 98). Eve also threw the javelin, 2nd 'B' with 25m 78 and she won the 'B' shot with 6m 58. Our Male athletes were Graham Boreham, Chris Burgess, John Byrne, James Cain, Lee Coupland, Harry Flanagan, David Gough, David Hamilton, Liam Harris, Ethan Harrison, Andrew Kershaw, Darion Moore, Drumayne Moore and Jack O'Neill. Harry was outstanding in the sprints winning both the 100m and 200m in 11.1 and 22.0. Jack was our other main sprinter running 12.6 and 25.3, with Ethan, Darion and Chris having their own race as non-scorers, running 12.2, 12.3 and 12.4. Ethan ran the 'A' 400m in 56.0 but Graham was faster in the 'B' race with 54.7, almost his fastest this year but Ethan has run faster, 54.33 at the county champs in May. Graham ran a PB in the 800m, in 2:09.0 to win the 'B' event but it was Andrew Kershaw who took the 'A' place. Its 3 years since Andrew competed on the track but he has pedigree, with a PB of 1:55.59 from 2015. He didn't quit get under 2 minutes today but won the race in 2:01.7 He went on to a more leisurely 1500m pace to take 3rd place in the 3 3/4 lap race in 4:22.3. Under 17 James Cain also came along for the 1500m and ran a very creditable 4:58.9. 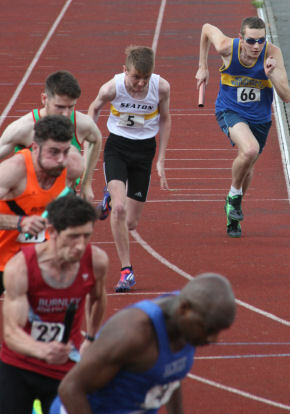 In the 5000m race David Hamilton teamed up with David Gough, David H coming home in 4th place in 17:25, 9 seconds faster than at Litherland, with David G running 21:13. Drumayne took 2nd place in the 400m hurdles, his first attempt at this event I think, running 69.8 with Lee taking 'B' points with 95.4. Lee teamed up with debutante John Byrne in the 3K s/chase, Lee running 17:49 and John 15:15. John also cleared 1m 55 for 2nd place in the high jump where Lee competed as well but didn't quite manage the opening height. Darion achieved a good new PB in the long jump of 4m 87 with Drumayne clearing a best of 4m 56. Drumayne also triple jumped 10m 33 with Lee clearing 8m 68. In the throws, Liam again won the hammer with 39m 72. He also threw the discus 26m 39 and the javelin 23m 62. and put the shot 9m 76. Chris threw the javelin 26m 74, the discus 16m 51 and he put the shot 7m 70. Finally, in the hammer, Lee threw a best of 19m 61. Thanks to team manager Lee Coupland and a great bunch of athletes. Thanks too to our officials; Dave Whitehead, Steve James, Steve Boreham, Emma Howarth, Barrie Hughes, Lesley Scott and Lee Coupland.